I suspected that when Keith contacted me with another commission it would be something interesting. I knew very little about the crios but Keith is excellent with his research and was able to send me lots of images and information about it. 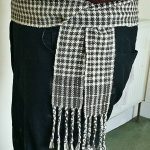 Many of the traditional Criosanna are warp-faced pieces of fabric but Keith wanted his to reflect the design of his Shepherd’s Plaid so there had to be a bit of artistic licence when it came to the design of the piece. The stitches every 25cms help to keep track of the length. As there were only 67 threads in the warp, the set up of the loom was relatively quick and weaving progressed quickly. 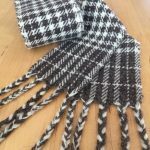 The main difference in the finishing of the plaid and the crios is the fringed tassels along the ends; the plaid has twisted fringing while the more traditional finish for the crios is a plaited fringe; I like both methods. 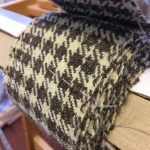 The three elements of the plaid that Keith wanted represented in the crios were the deep dark bands at either end, the wider stripes along the edges and the Northumbrian tartan central section; easier said than done when the fabric is only eight centimetres wide! I received a beautiful package today! 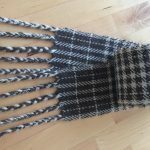 – another from the amazing Janis Embleton at ‘Flight Weaving’ – a hand woven celtic crios! When Linette and I were down visiting Janis to collect my Shepherd’s maud recently, I enquired if she could also weave a crios in the Shepherd’s tartan, to which she agreed. Crios (pr: ‘kriss’) in Irish gaelic simply means belt. Criosanna (plural) date back as far as the 1600s and maybe even before that in celtic history. The Irish Crios survived well into the twentieth century, worn by Irish and Scots alike and more famously in recent times it wis woven and worn by the fowks of the Aran Islands. The Crios is usually around three metres long and worn wrapped around the body with one end left hanging down, but it isn’t uncommon for it to be worn with two ends hanging down also. As well as holding up a man’s Léine shirt (lang saffron shirt), fèileadh mòr (great kilt), fèileadh beag (small kilt) or Triubhas (trews/trousers), criosanna have been used in handfasting ceremonies over the centuries too. A handfasting is a component of a celtic wedding ceremony which entails gently wrapping cords around the bride and groom’s clasped hands and tying a knot, symbolically bindin’ the couple together in their declaration of unity. The term ”tying the knot” comes from this. I am over the moon with this crios for many reasons – because it’s the shepherd’s tartan, because it was hand woven by a traditional and artisan weaver and also because this is the only one of its kind in the world – nobody else has one of these. I am blessed and honoured to wear a bespoke piece of our history, created by a lady who appreciates the beauty of hand made creations as much as I do. Thank you so much again Janis and thank you Father for this beautiful piece of art, one that I will treasure. I think you will agree that the finished crios looks wonderful.